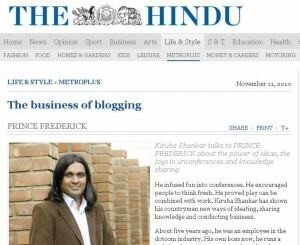 Kiruba Shankar, CEO of Business Blogging was featured in The Hindu Metroplus Weekend dated Nov 12. “He infused fun into conferences. He encouraged people to think fresh. He proved play can be combined with work. 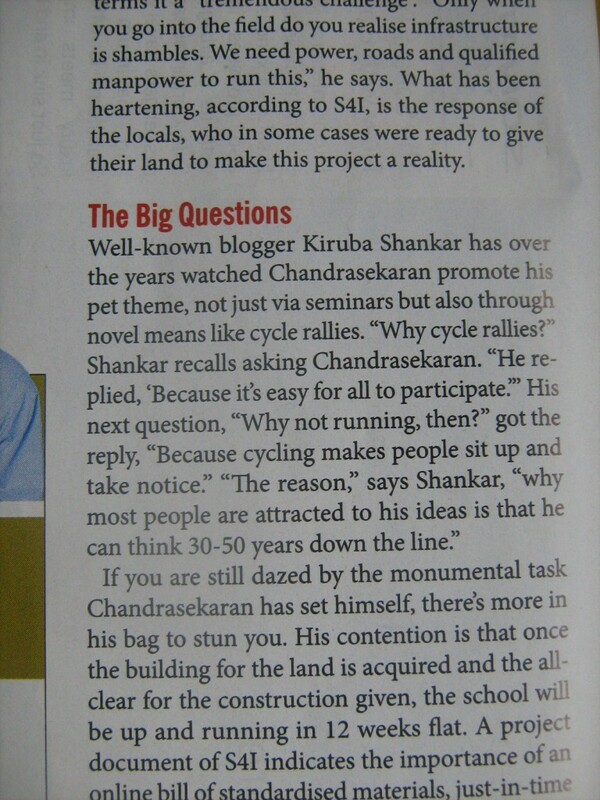 Kiruba Shankar has shown his countrymen new ways of ideating, sharing knowledge and conducting business. About five years ago, he was an employee in the dotcom industry. His own boss now, he runs a web development company and another that provides organisations with “ideas that can make all the difference”. 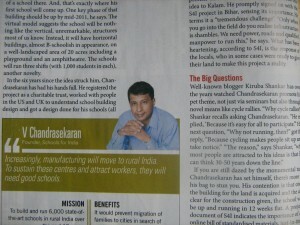 Mr. Kiruba Shankar was quoted in an article titled “School is In” in Outlook Business (September 4 2010 edition). 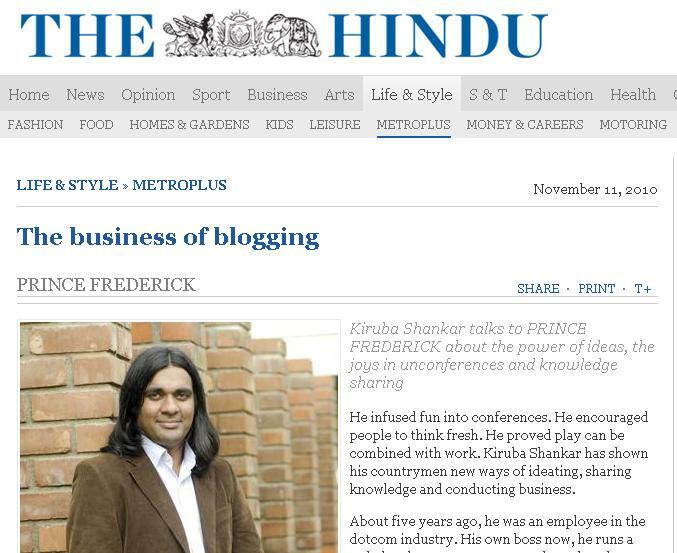 The article features MR. G. Venkatesh – founder School for India initiative (for whom Business Blogging has been helping with online initiatives). We are happy to share with you the photos of the article. Schools for India is a non profitable charitable global organization. Each country organization is independent of each other, and complies with the local laws and regulations. Schools for India is involved in creating the best in class schools across India, with the aim of providing education for the people of rural India. 6000 schools across the country have been planned. Each of the schools will have the capacity to teach 945 students, including up to 15 special children from primary to secondary school. Business Blogging is proud to be associated with Internet and Mobile Association of India (IAMAI) as Official Social Media Partner. The Internet & Mobile Association of India (IAMAI) is a not-for-profit industry body registered under the Societies Act, 1896. Its mandate is to expand and enhance the online and mobile value added services sectors. It is dedicated to presenting a unified voice of the businesses it represents to the government, investors, consumers and other stakeholders. The association addresses the issues, concerns and challenges of the Internet and Mobile economy and takes a leading role in its development. The association’s activities include promoting the inherent strengths of the digital economy, evaluating and recommending standards and practices to the industry, conducting research, creating platforms for its members, communicating on behalf of the industry and creating a favorable business environment for the industry. Founded in January 2004 by leading portals in India, IAMAI is the only specialized industry body in India representing the interests of online and mobile value added services industry. IAMAI regularly conducts various conferences, workshops and roundtable events on key issues concerning the telecommunications industry and users. As the official social media partners for IAMAI, Business Blogging will be bringing following value additions to IAMAI’s activities. The recent most IAMAI event which we covered extensively was National Security & Digital Technology Conference in New Delhi. Check the event coverage here and photos here. The next event will be The Mobile Ad Conference, hosted at Hyatt Regency, Mumbai, on 7th of April. Catch us there for all the action or stay tuned to IAMAI blog to catch the live blogging updates. Should I, as a CEO, blog for my company? What is the advantage by doing that? What are the negatives that could come out of it? – These are the most frequently thought over questions by CEOs before making their decision. We will try to answer these questions for you. Whether to blog or not is of course a personal decision, but there are a few factors that you could consider before taking the decision. But mind, there would be little time for you to spend on blogging. So, the update frequency of the blog would not be constant. So, the people reading your blog would not know when to come back to check a new blog. If they get disappointed with the update frequency, there is a high chance they might abandon the blog. So, If you think, as a CEO you have little time to blog and you can’t come up with regular posts, It is better not to enter into blogging. Do not even consider a Ghost Writer. It is always better to consider both sides of the coin, so we must discuss the negatives that could come out the blog. What you say in the blog is as powerful as what you say in a media interview. 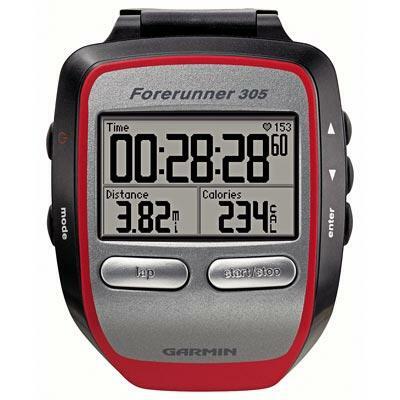 There is a high chance that your competitor is following your blog. So, take care as to what you put in your blog. Someone might post awkward comment or question in your comments section. If handled carefully it adds as a big positive opinion boost to your company. But, suppose if the comment/question is ignored or mishandled, it could create a negative impact. 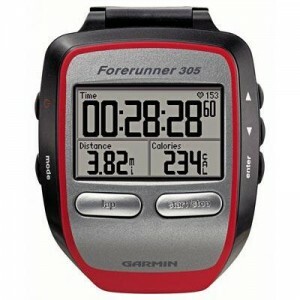 On the whole, with a little care, if you could blog regularly, just go ahead, it could prove out to be a big success.